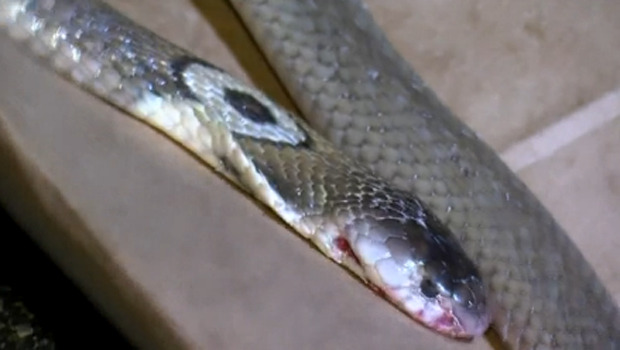 AUSTIN, Texas -- Austin police say a cobra believed have bitten and killed an 18-year-old Central Texas man who was transporting the snake in his car has been found dead. Police say the venomous snake was found early Friday morning near an intersection about half a mile away from the parking lot of the home improvement store where Grant Thompson of Temple was found unresponsive Tuesday. Thompson, who had puncture wounds on his wrist, was taken to a hospital where he was pronounced dead. Shaun Toneff, who works in the same strip mall as where Thompson was found, told CBS affiliate KEYE-TV that he found the monocled cobra on the I-35 Frontage Road just outside the parking lot. Toneff said that he turned his car hazard lights on and approached the snake cautiously. "I turned on my flashlight and saw that it was it. You recognize the flat spot and the monocle on the back, of course," he told KEYE. "I just got a quick a peek as I could without it trying to bite me. It was already dead, of course, but I didn't know that." When people searched Thompson's car they found another snake, six tarantulas and a bullfrog. He worked at a pet shop in his hometown of Temple. The Temple Daily Telegram has reported he would show exotic animals to children. Police didn't immediately return a call for more information Friday morning. Thompson worked at a pet shop in his hometown of Temple and KEYE-TV reported he would show exotic animals to customers. "Whether he would have birds, or possums or lizards, or snakes, spiders. He would talk a little bit about each animal," family friend Charlie Kimmey told the station.